Create a chic kitchen for your beloved culinary pursuits. Whether you’re an avid cook or someone who just enjoys eating, there’s no denying the value of a beautiful kitchen. Aside from a place to cook up a storm, the heart of the home has become the default gathering place—in most cases occupying a bigger square footage to accommodate an eat-in area, a living space and a large cooking theatre. For those refashioning their kitchen or building one from scratch, we’ve culled expert insight on how to create a chic kitchen in five easy steps. If space allows, an island kitchen is the ideal layout to go for. Compared to the galley style, island kitchens allow for the “ability to interact with guests while cooking in a fluid, big space”, says Bong Yee Chein, head of product at Miele. Once you have decided on the layout, the next step is determining the materials—from surfaces and backsplashes down to the flooring. According to Ed Ong, designer and founder of The Kitchen Society, this step is important as the right foundation directly relates to a kitchen’s longevity. Practicality is key. “A must-have feature in the kitchen is a tempered glass backsplash for the wall behind the cooking zone, where the hob and hood are located. This allows for easy cleaning,” he shares. The worktop is another key area to invest in. “Well-selected materials for worktops make a huge difference. I personally like quartz because it’s non-porous, hygienic, rigorous, and can be cut to fit any odd-shaped space,” adds Ong. Once you’ve chosen the key surfaces, decide on the cabinetry and appliances. “Cabinets are the ‘face’ of your kitchen,” says Ong. Homeowners must also be mindful of the smaller details. From the type of fixtures down to the accessories, all these touchpoints enhance—or detract—from the ergonomics as well as ambience of a kitchen. A simple example is the type of sink to go for. “I highly recommend under-counter mounted sinks as it allows for liquids and debris on the countertop to be hand-swept without any obstruction,” shares Ong. The power of good lighting must also be harnessed. “Never underestimate the importance of good lighting in a kitchen. Functional, task and mood lighting all need to be carefully considered so that the kitchen can allow the home cook to work, entertain and mingle,” says Hunt. Don’t overlook the details when it comes to appliances, either. “At De Dietrich, some of our pieces are embellished with metallic strips and copper that complement the interior,” says Angeline Yeo, marketing manager at Brandt Asia. While timeless styles always reign, it does not mean you have to stick with generic looks. Aesthetics is not the only way to personalise a space. Take a closer look at technological innovations to determine what suits your needs and lifestyle. “Simple features such as an instant boiling tap to dispense water for the avid cook or an integrated kitchen scale for the home baker can make a distinct difference,” stresses Hunt. 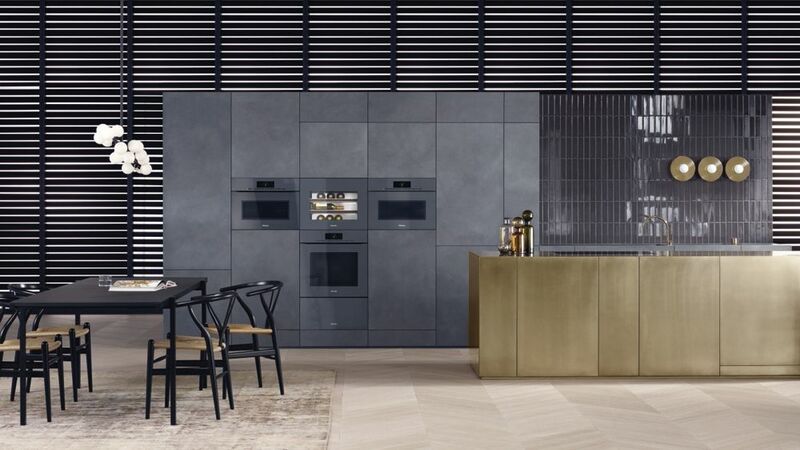 All leading kitchen brands, including De Dietrich, Gaggenau and Miele, always place emphasis on the role of technology in simplifying cooking and living. “Zoneless induction hobs allow you to cook several pots simultaneously, so it’s handy for homeowners who wish to whip up a feast,” says Piyong. This article was originally published in Singapore Tatler Homes February-March 2017.